How Many Drinks Can You Have Before You’re Above the Los Angeles DUI Limit? 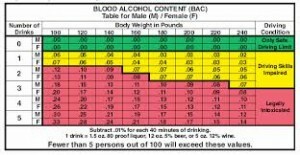 It’s a common question with a surprisingly subtle answer: How many alcoholic drinks can you consume before you’re over the Los Angeles DUI limit of 0.08% BAC – the cutoff point for misdemeanor DUI, as defined by the California Vehicle Code? As you might remember from driver’s ed, you can roughly calculate the answer based on your gender and body weight. Key variables involved include your weight, the number of drinks you consume, and the time that elapses between drinking. • The more time that elapses after you start drinking, the less intoxicated you’ll be, since your liver will have more time to process the alcohol and clear it from your system. As a general gauge, this system does a pretty good job. But these estimates are really just ballpark figures. You can follow the system to the letter and STILL wind up with a high blood alcohol concentration and a DUI on your record. In some ways, this system is similar to the one that your doctor might use that shows the relationship between your BMI (body mass index) and health. In general, you want to avoid being obese – just like you want to avoid consuming massive amounts of alcohol and spiking your blood alcohol level above 0.30%. • Whether you’re fatigued, stressed, angry – or well-rested, calm, and in good spirits. The moral is that trying to calibrate an ideal formula for everyone to prevent DUI driving is a bit silly and naïve; it ignores all the complexities of human biochemistry and the complex dynamics of safe driving. For help dealing with your Los Angeles DUI arrest, look to the Harvard Law School educated Attorney Michael Kraut and his team at the Kraut Law Group. Mr. Kraut is an ex-prosecutor with tremendous experience – in his capacity as Deputy District Attorney for Los Angeles, he racked up a very impressive 99-plus percent success rate at jury trials.